Another installment by Joe Ricchio, a Maine bon vivant and food editor of the state’s acclaimed Down East magazine. We hope you enjoy his unique perspective. After being on a lark for quite some time now, I have seen a plethora of different boutique hotels that each demonstrate a unique manner of embodying each locale’s culture and flair. Not all Lark Hotels have their own restaurant, so I am naturally excited when my stay includes the option to dine without leaving the hotel. 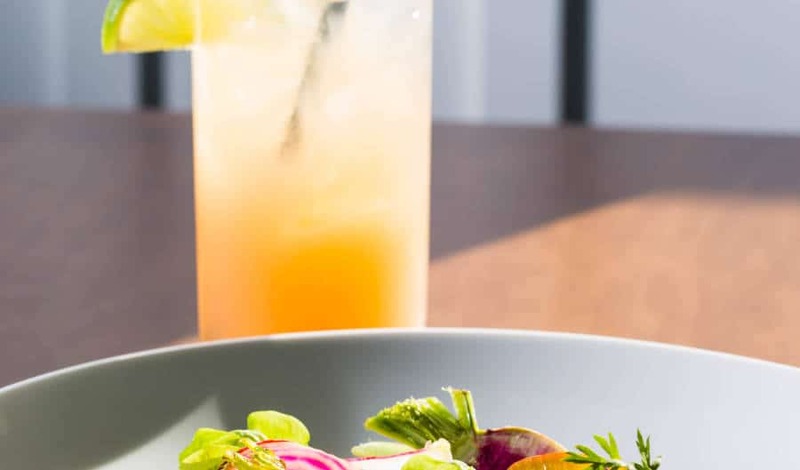 As you’ll find in this Chair 5 review, The Break’s in-house restaurant utilizes playful elements that conjure up surfing culture from a bygone era. To pigeon-hole Chef Basil Yu into one specific kind of cuisine would be impossible, as the reach of his larder extends to all corners of the planet. After making his bones under culinary legend Jonathan Cartwright at both Maine’s White Barn Inn and then at The Vanderbilt in Newport, Yu is not afraid to experiment with classic dishes like English pea soup, to which he adds Chinese roast pork belly and Thai basil, or imparting fiery depth to blistered shishito peppers with harissa. In Narragansett, he is particularly famous for his augmentation of classic beach fare ranging from lobster roll to a particularly decadent S’Mores Ice Cream Sandwich (which is so delicious that it has been featured in Food & Wine magazine). To further illustrate my point, I will cite the Funnel Clamcake – the name of which suggests that it bridges the gap between the cushiony, fritter-style clam cake and a decadent yet ethereal funnel cake. A dusting of bacon powder adds a savory, lip-smacking quality while the accompanying remoulade is brightened considerably with the addition of aromatic lemongrass while taking care not to overpower the primary ingredient – fresh clams. Admittedly, it is tempting to fill up on the warm, herbed cheddar biscuits, smothered with soft, salty butter that quickly melts through each and every crevice, which are brought to the table as you peruse the drink list, but it is advisable to save room and order as many courses as humanly possible. While the emphasis is most definitely on local beer and new world wines, it is hard to dispute the merits of an ice-cold bottle of Trimbach Riesling from Alsace when confronted with dishes like fried Point Judith Calamari battered in cornmeal. When you are this close to the source, the squid in this town is almost always going to be good, but in this case the showering of diced Fresno chilies and chopped cilantro, along with scallop “chicharron,” essentially a house-made version of the classic shrimp cracker, puts this unorthodox version at the top of the heap. A superlative assortment of oyster species anchors the raw bar, along with plump, tender shrimp dusted with old bay and served with piquant cocktail sauce, made with sambal oelek, that is quite moreish and equally transcendent with the chilled half lobster. Between courses, you may be inclined to step out on to the patio (or you may be dining out there to begin with and if so, good for you!) and linger in The Break Hotel’s luxurious heated saltwater pool, but you know what they say about waiting 30 minutes before swimming. Better to dive into a pool of creamy, New England-style chowder with clams, whelks, and bonito enhanced by utilizing umami-laden dashi as a base rather than classic fish stock. While more substantial offerings include a seared NY Strip steak with grilled peaches and cocoa macron butter and buttermilk fried chicken with silky chicken veloute, it is hard to resist the siren’s call of pineapple braised short ribs. The distinctive, crunchy papaya salad is beautifully refreshing alongside the sweet, succulent beef and ultra-fresh herbs, and it is worth mentioning to these very ribs end up in the hash if you are fortunate enough to attend brunch service on either a Saturday or Sunday morning. 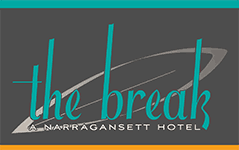 A luxurious respite from the traditional Narragansett sprawl, the service here is attentive while remaining seamless. The food I have detailed in this Chair 5 review is but a small subset of the full scope of Chef Yu’s prowess in the kitchen, and it is easy to see why, in the peak months, a reservation can be difficult to come by.